I’m still working on the, you know thing, but I stumbled across the Late Medieval and Renaissance Illuminated Manuscripts – Books of Hours 1400-1530 guide from The Institute for the Study of Illuminated Manuscripts in Denmark, and wanted to point it out. And while I’m posting, I ought to mention this article which discusses the British Library’s recent purchases of three of the missing leaves from the Sforza Hours. 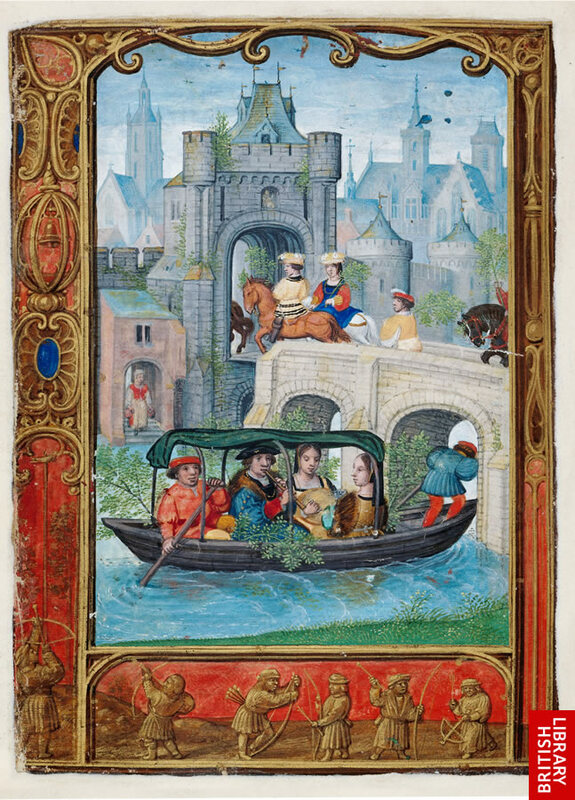 While you’re at the British Library’s site, you should definitely visit their Illuminating the Renaissance site about Flemish manuscript painting. Xerox’s Palo Alto Research Center (PARC) alumnus Austin Henderson says that “one of the most brilliant inventions of the paper bureaucracy was the idea of the margin.” There was always space for unofficial data, which traveled with the official data, and everybody knew about the relationship between the two. As Udell makes clear, he’s paraphrasing the forthcoming research of Austin Henderson, and it’s an interesting comment. It’s not, however, quite accurate. Yes, marginal glosses are used in medieval (and earlier—think Egyptian papyri) manuscripts just that way. But the “everybody knew about the relationship,” well, no, they didn’t, and no, we don’t. Those marginal comments, or glosses, were used by readers to make reflective annotations, to add reference material by other authorities, to make corrections, or even to doodle. Scribes also used margins to make corrections, or sometimes, just comments. And of course marginal comments weren’t restricted to the right and left margins, or even the top and bottom—readers made interlinear comments too, like these in the Book of Lindisfarne which provide Old English translations of the Latin Gospel. And then for certain texts, and classes of texts, the glosses were soon seen as a sort of textual appendix, one that was right on the page with the main text (what, you didn’t know hypertext was a manuscript tradition? Think of the Talmud.) Remember that manuscripts were copied by hand, often by professional scribes, in or out of the monastary, and often by private individuals. Professional or not, scribes get tired, and hungry, and have trouble with the light, and often, are copying texts in languages they can’t read. And sometimes, a scribe didn’t realize a marginal gloss was a gloss, and so the gloss was incorporated into the main text. OK, a lot of times— it happens so regularly that it’s a field of paleographic specialization. Once a gloss is incorporated into the body of a text, it’s frequently transmitted, so the error perpetuates, and even propagates. My point, which I realize is somewhat divorced from John Udell’s context, is that as we work out semantic data and metadata and document standards, we need a way to do “digital marginalia” so that meta data identifying marginalia travels with it, because it’s a real pain comparing versions of an ancient text in an effort to determine whether text that appears corrupt is in fact part of the text, or a scribal error of addition. I don’t even want to think about doing that with a digital record. At the request of Janice Safran and Heather Blatt I’m posting this small detail from the Annunciation of 1465-75 produced by the workshop of Rogier van der Weyden in Brussels, Belgium — possibly by Hans Memling— and in the collections of the New York Metropolitan Museum of Art. Sifran and Blatt are interested in hearing from anyone who’s seen a similar object in other images or heard one described in writing. They are presenting a paper on “ Lighting the Spark: The Medieval Itty-Bitty Book Light” and are in hopes of locating similar images. They have already explored The Annunciation from the left wing of the Dijon Altarpiece (1393-99) by Melchior Broederlam in the Musée des Beaux-Arts in Dijon, France; the Annunciation of 1482 by Hans Memling in Brugge, Belgium, also in the collections of the New York Metropolitan Museum of Art. an ancient convent perched atop a 2,500ft peak in eastern France, a locked library containing a priceless collection of early printed books and illuminated manuscripts, a secret passage – and a series of spectacular and inexplicable thefts. I was making one of my regular “search the web for digitized manuscripts” searches when I discovered this web-based interactive jig saw puzzle based on an image from a Parisian Book of Hours. Try it, it’s fun!